So very pretty - I will have to check out these Pan Pastels. It is hard trying to keep up with you Miss Sylvie and all your cards are so very lovely! Hi Sylvie, thanks for dropping by. :) The background on your card looks fabulous & I love the 3D bloom. Lovely card such delicate colouring. Wow Sylvie .. .. where have I been?!?!?!?!?! Sorry I have missed so many lovely makes. This is a lovely style. I am still chasing my tail. Just waiting for my printer to finish so taking the chance to have a few blog visits! I noticed the pan pastels were on offer at Click On Crafts...reduced from £7.99 - £4.99 each. I don't know much about them, so wouldn't know which colours to choose. Hi Sylvie, this is so elegant.Just perfect. 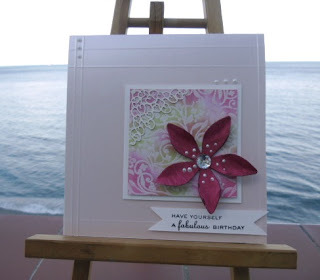 How beautiful Sylvie , love that corner on the image.What a fabulous card I love this one , great colours and that image is super well done. Hi Sylvie, my goodness this is just BEAUTIFUL. I'm loving the Pan Pastels! Lovely card! the flower made this card beautiful!